By Ashutosh KS in Internet. Updated on October 11, 2017 . In this post, I want to show you 12 Vivaldi features that sets it apart from the other major browsers out there. 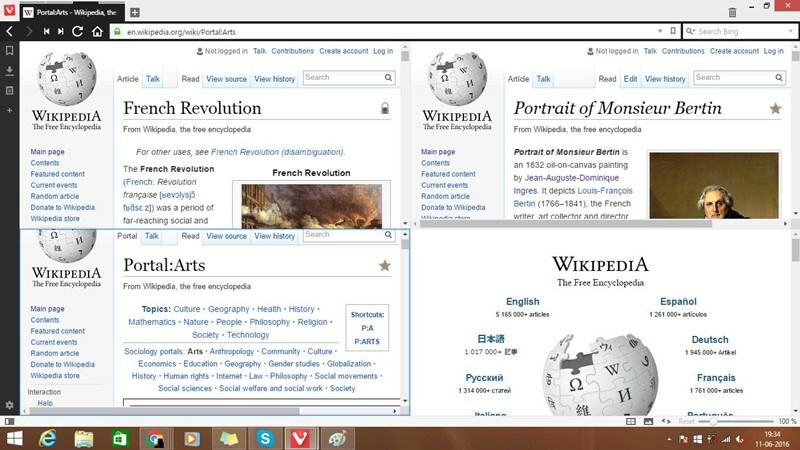 Vivadi’s Quick Commands lets you search for nearly everything from bookmarks and browsing history to configuration settings and open tabs from the same place. It can be activated with the F2 key, which opens the dialog box at the top of the page. 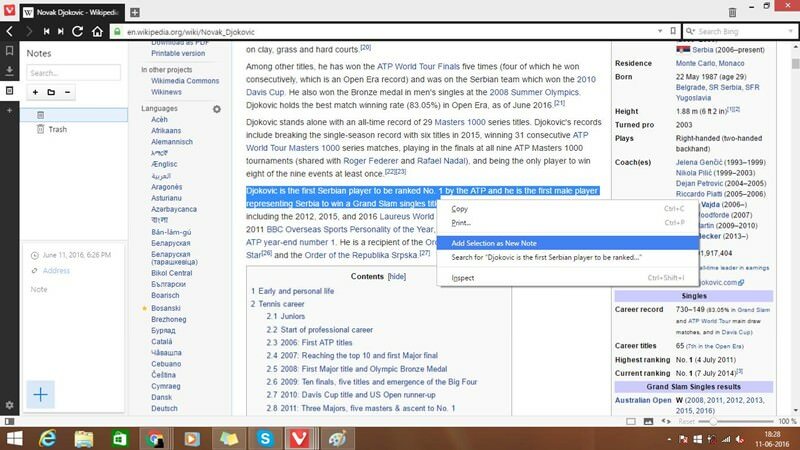 Type your search query to find what you need. 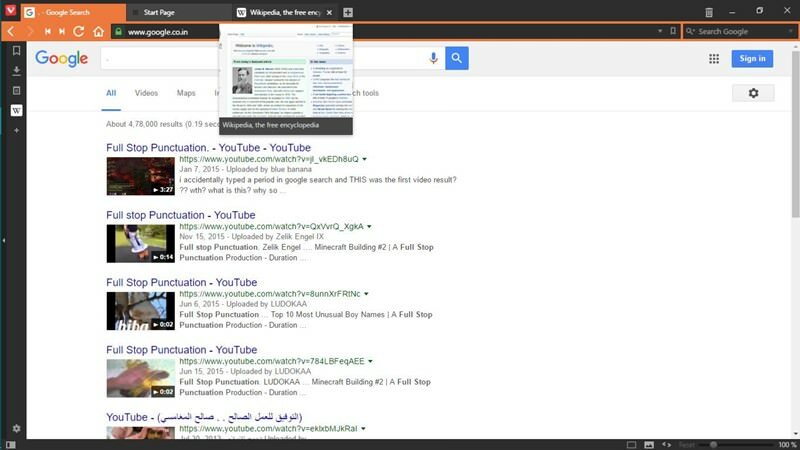 The keyboard shortcuts for various commands/tasks are also displayed alongside the search results. 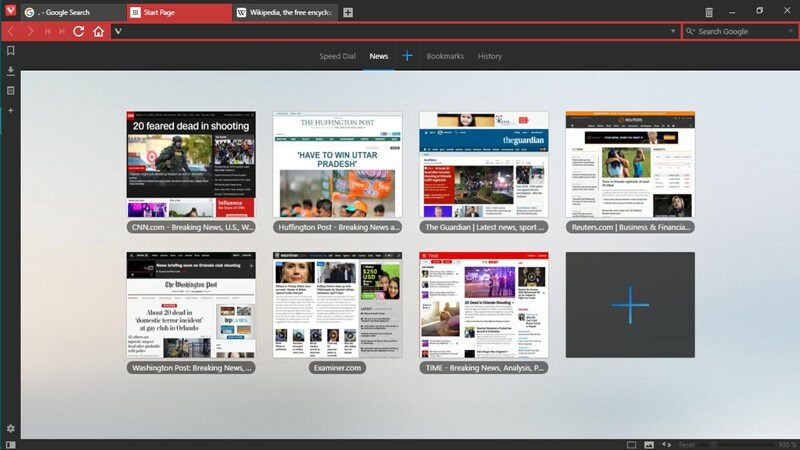 For example, you can group all your favorite news-based websites into a single folder named News, and do something similar for Social Networks and others. Vivaldi introduces the ‘Fast Forward’ and "Rewind" buttons for speedier navigation between pages. While ‘Back’ and ‘Forward’ takes you one page at a time, "Rewind" and "Fast Forward" lets you navigate in great strides. Fast Forward helps you navigate to the following page of the webpage you are on. 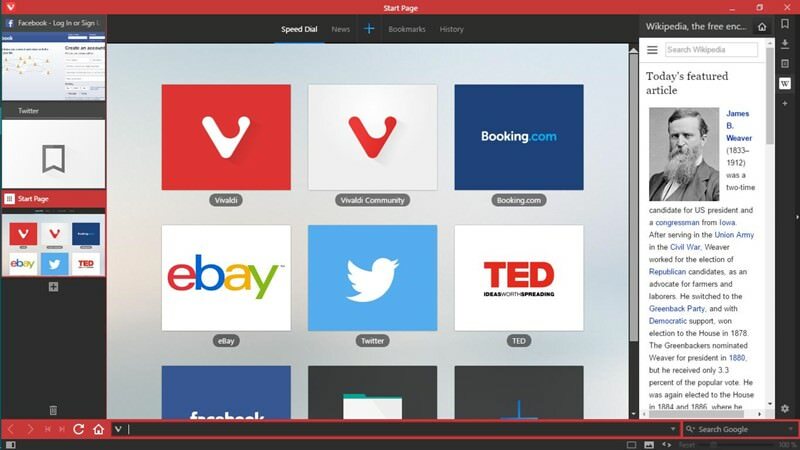 Rewind takes you back to the first page you visited on a particular website or domain. Notes, in Vivaldi, lets you make notes to save your ideas or thoughts. These notes can contain text content, screenshots of webpages, attached files and even link to a specific website. With Vivaldi Notes, you no longer require a third-party note-taking app. 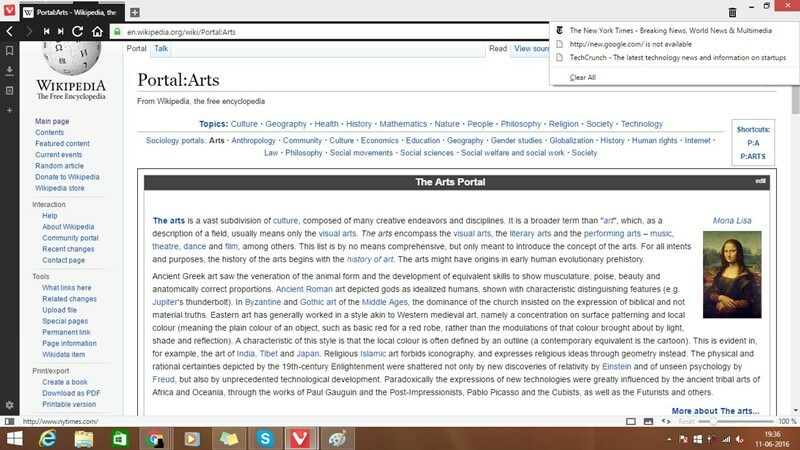 The easiest method to create notes is by selecting any content on a web page, right-click to view pop-up menu, and select Add Selection as New Note. Another method to create notes is to click on the Notes icon in the side panel and click the + button. All saved notes can be accessed from the side panel. Only the Edge browser carries a similar Notes tool. 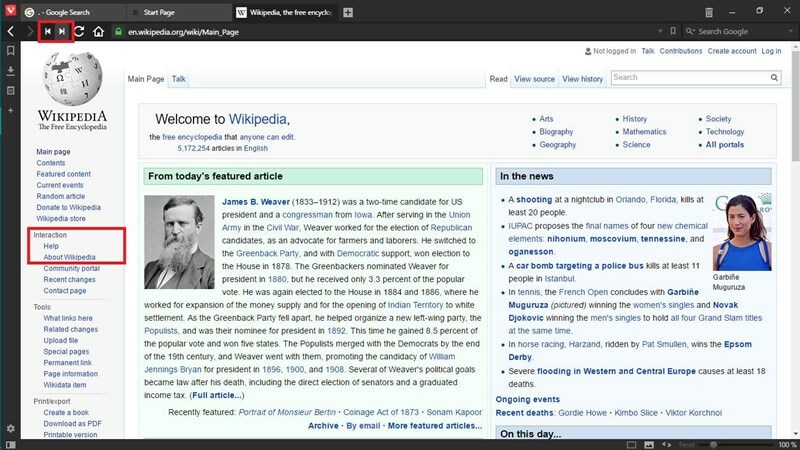 Web Panels in Vivaldi allows users to dock a web page in a panel on either sides of the main window. It works much like the main browser window and in this space, you can follow a developing news story, check your social media and chat with people. Click the + sign on the left panel and enter the website’s URL. On doing this, the web page is displayed in the panel. Its size can be adjusted as per your requirements. In this example, a Twitter page has been added to the web panel allowing the user to view the tweets on his/her timeline while browsing continues. 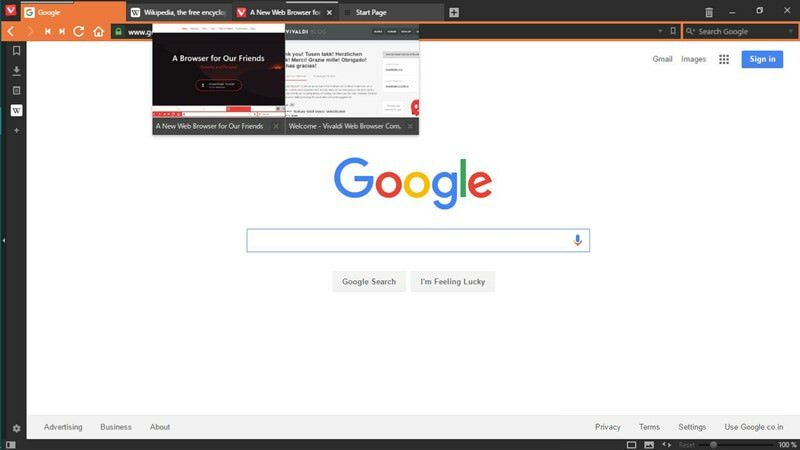 Vivaldi allows users to save a string of opened tabs as a Session, which can be named an opened in the future. To save a session, you need to go to the File > Save Open Tabs as Session. You can also name the session so you can easily remember and organize multiple sessions. To open a saved session, go to File > Open Saved Session… and choose the session’s name from the dialog. Although in Chrome and Firefox, users can save sessions automatically upon exiting the browser, it only reopens those that were available at the point the browser was closed. 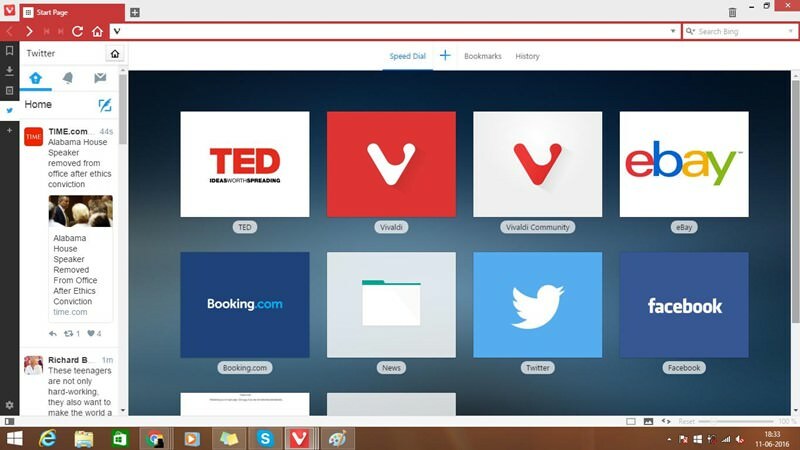 Vivaldi’s Visual Tabs gives you a glance of the open tabs when you hover over the tab. 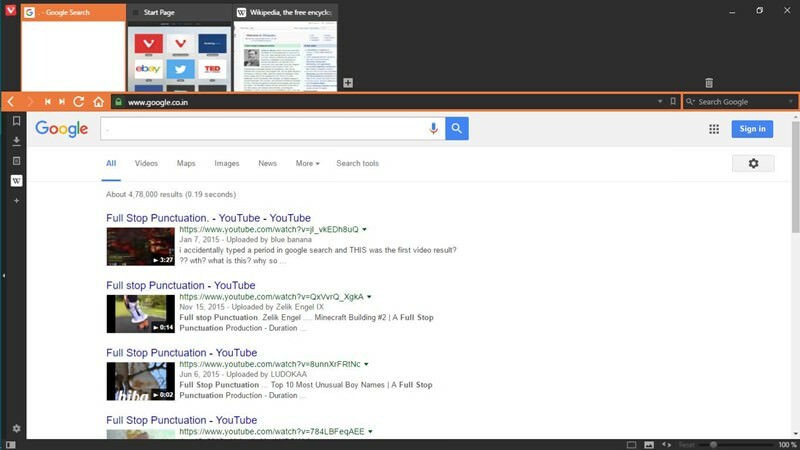 A small windowed preview will appear and show you a sneak peek of each tab’s content. This will prove useful when one has too many tabs opened. 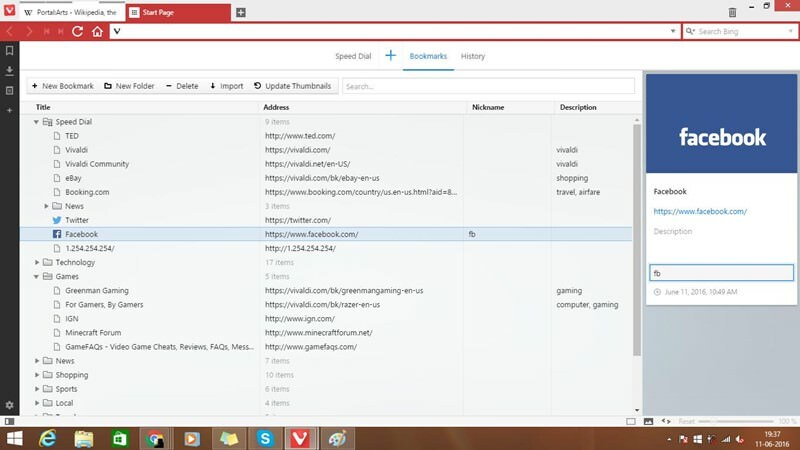 To preview a single tab, simply hover over any tab to have a glance. 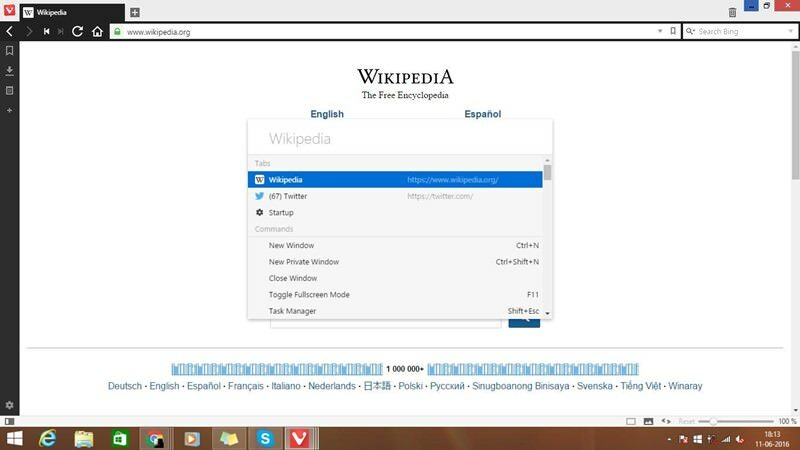 You can also get a direct preview of all the opened tabs, without hovering. 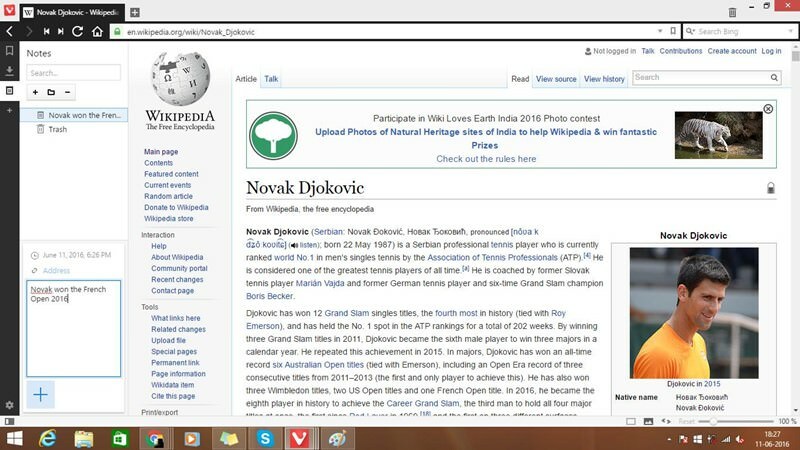 Just click on the line between the tabs and the address bar, then drag downwards to reveal mini-windows of each tab. You will get a preview of all the tabs opened. To activate the Visual Tabs feature, if it is not already enabled in Vivaldi, open the Settings, select Tabs in the left panel and under Tab Display, check Show Popup Thumbnails and Show Tab Thumbnails. If you are a user who prefers to see a fewer tabs on the tab bar, Vivali also lets you stack the tabs you want to open. The feature called Tab Stacks works just like the Windows Taskbar’s ‘combine buttons’ feature. To stack tabs, drag one tab over another. If the other tab shows a small divider line at the top, it means the tabs are now stacked. To access the tabs in the stack, just hover your mouse over the stacked tabs and it will display the thumbnail previews of all the stacked tabs. Click the tab you need. In the Vivaldi window’s status bar, there is a ‘Page tiling’ button near the zoom indicator. This button can be used to choose and change the tiling patterns. A tab stack can be tiled by right-clicking on the tab stack and selecting Tile Tab Stack from the context menu. Trash Can in Vivaldi is a tab management feature that helps you restore closed tabs or blocked pop-ups quickly. Accidentally closed tabs that you didn’t meant to? Just click on the Trash Can icon in the tab bar and select the closed tab from the context menu to reopen it. 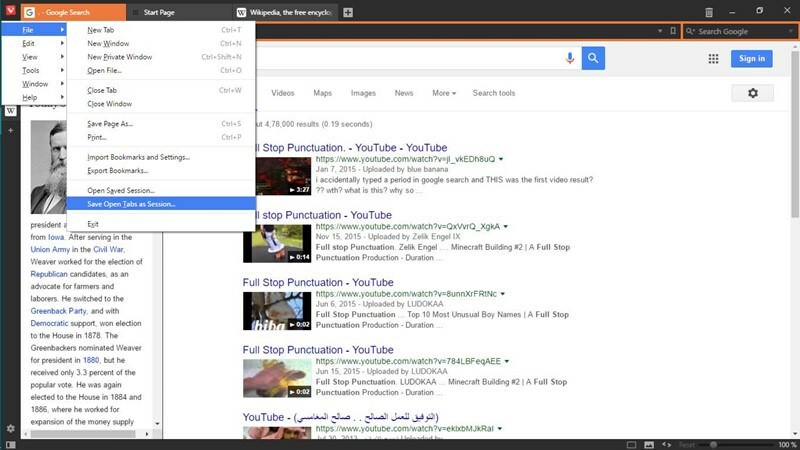 It is a faster option, compared to those found in other major browsers. You can press Ctrl + Shift + T to reopen closed tabs but they are reopened based on the order of succession they were closed. Another interesting feature of Vivaldi is that its color scheme will adapt to that of the website you are currently browsing. 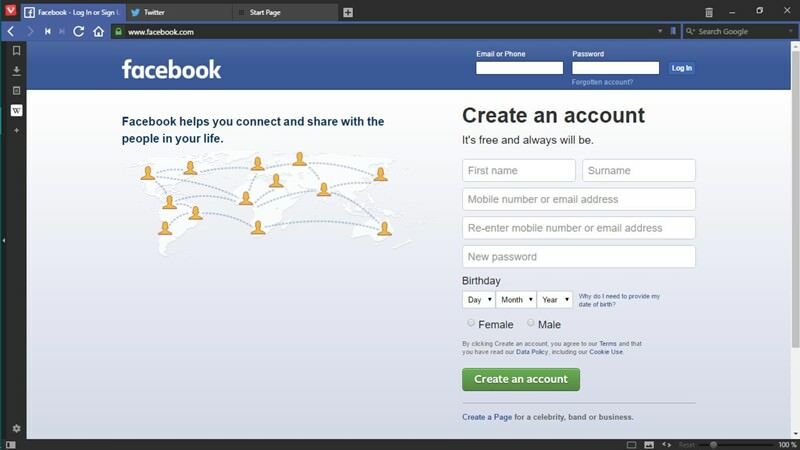 For example, if you are browsing Facebook, then Vivaldi’s tab and controls will turn blue.